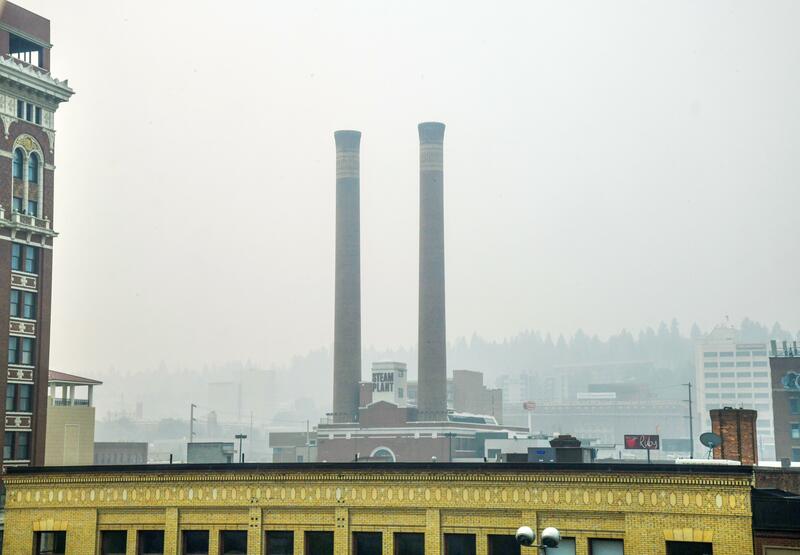 As of 8 a.m., the Spokane Clean Air Agency reported city air was unhealthy for all, with its downtown air monitor reporting high levels of wildfire smoke contaminants. Two other monitors, in north Spokane and to the east in the valley, measured air that is unhealthy for sensitive groups. By 11:30 a.m. the air quality improved to moderate. Spokane Public Schools’ smoke policy is to keep kids indoors during recess and conduct physical education indoors, with light indoor activities. As for any scheduled athletic events or practices, policy is to cancel the event or hold it indoors if possible. The cloud of hazy smoke over the region arrived after days of clean or moderate air that seemed uncharacteristic during one of the region’s worst wildfire seasons. Stephanie May, spokeswoman at the Spokane Clean Air Agency, said for much of Wednesday evening and early Thursday morning, air quality was hovering between moderate and unhealthy for sensitive groups. At about 7 a.m. is when the scales tipped into harmful for all. “The darn wildfire smoke is back,” she said at the time. The National Weather Service reported an eastbound wind Wednesday afternoon that carried smoke from fires still burning in the Cascades and British Columbia. In Chelan County and Okanogan County near Twisp, firefighters reported the Crescent Mountain and McLeod fire together have grown to about 70,000 acres, with little containment. “The terrain is just rugged,” said Cody Rohrbach, fire chief of Spokane County Fire District 3 who was in Leavenworth Wednesday helping fight the blazes. Mark Turner, a meteorologist at the weather service, said that as of Thursday morning, Spokane had the worst air quality in the region. For up-to-date smoke information provided by multiple state and regional agencies, check the Washington Smoke Information blog here. Published: Aug. 30, 2018, 8:59 a.m. Updated: Aug. 30, 2018, 4:12 p.m.